Niall Quinn thinks Newcastle are playing transfer market games. | NUFC Blog. Niall Quinn thinks Newcastle are playing transfer market games. Quinn - an unwashed legend. Our unwashed friends from down the road have today had their say on just how they interpret the revelations that Newcastle could be the poor relations in the North East next season. Sunderland Chairman Niall Quinn is wary of the statement issued by Newcastle United owner Mike Ashley that claims we wont be spending much money over the summer, or any at all depending on which version of capital outlay you lean towards believing. Whether lowering expectations is a good thing or a bad thing is up for debate. On one hand it lowers pressure, but for a support that has been used to money being sloshed around on big name players for a number of years previously, the lack of money has come as a bit of a culture shock. Of course we will need the observe the summer transfer window as a whole to see just how much other teams are tightening their collective belts, and you can always expect some exceptions to what is becoming recognised more and more as a financial crisis in football. Roman Abramovich has already set the target for Chelsea to be self sufficient in the near future whilst Aston Villa supremo Randy Lerner stated that Villa will be selling to buy over the summer. I’m not really interested in what the others are doing in the transfer window though, unless it involves Newcastle. Don’t get me wrong, I will have one eye glancing at activity elsewhere, but I am more focussed on what we will be doing and whether Chris Hughton is given the best possible chance of guiding the team to survival come the end of the season. Newcastle ‘appear’ to be boxing clever. That was still allowed, last time i looked. Owt that upsets the tramps is fine by me. I couldn’t bring myself to put a photo of him in a Sunderland shirt up. how did the ‘s’ word get through the profanity filter mate? There’s bairns come on here. I guess theres nothing to do over that shitland. Nort East? Is that a play on Quinn’s Irish accent? To be sure. I’ve heard people on radio 4 refer to us as the n’th east in their pathetic attempt eradicate vowels from the english language. surely we must be happy if we can get 3 or 4 players in which will impriove the team and squad. Does it matter if they are fulltime signingas on 3/4yr contracts? surely its better to have players of quality for a season long loan, with something to prove, then to have people who will sit back in the comfort zone of a 3/4yr contract. i want what s best for Ncle and if that means loans (quality ones) and free agents so be it. I want to support Ncle for years to come and for us not to be where Pompey / West ham / Hull / Liverpool mite be in the future. Support the XI on the pitch week in week out!! doesnt matter if they are loans or not. After all we had good success with loans last season, they all did a job! Point taken. lol. It just doesn’t scan with me brain typing Hughton, for some reason I keep putting an o in there. I agree Jettson,with our ‘possible’ wage cap we may even find it easier to get better quality players on loan than we would be able to buy and attract to the club(if transfer funds are available).Van Aanholt had quality and never let us down,there must be lots of quality out there that we could bring in.Obviously buying is better but as Toonsy says if the moneys not there it’s not there.At least with loans you get to see how the player does before deciding whether to try and buy. The problem with loans is that I cant see any Prem team giving us a loan player that will more than likely sit on the bench. I was thinking more foreign teams Toonsy or Prem teams who need to reduce the wage bill,especially in the current financial climate. And who was telling me the other day that confidence and team spirit doesn’t have an effect on Newcastle’s performance? Look at Toonsy. He’s falling to pieces here man! kan wee stopp wif thu englisch lessons now cos I skared to right anyfing now!! Why can’t te English learn to speak? Birmingham City boss Alex McLeish has made an £8million bid for Wigan winger Charles N’Zogbia. Wigan paid £6m to sign N’Zogbia from Newcastle United 15 months ago and now value him at £15m. Manchester City will give the first sign in the next 48 hours of their transfer spending power with an offer for midfielder James Milner, thought to be £24million. They expect Chelsea to compete for Milner and want to declare their interest first. Villa are expecting Chelsea to match City’s offer. Sources close to the player believe Villa will demand closer to £30m to even consider selling Milner. Scott Parker has been added to the list of players that Arsene Wenger has drawn up as potential summer targets as Wenger looks to bring proven experience to a young squad that faded out of the title chase. A fee of £12m has been speculated upon. With media gossip also speculating about summer moves for Habib Beye, Sebastien Bassong and Damien Duff, it would be reassuring to know that United inserted sell-on clauses in the deals that saw their players leave SJP – and that any funds raised would go towards squad strengthening. Its like us calling Shola a legend! half decent article about us in fifa.com today! exactly richietoon…. shall we forward it to the blackburn fans? So, we’re no longer imterested in Beckford – good, he had his chance to join us in January. Best of luck fella! It apprears that Hughton’s scouting games in Europe and at the same times looking to sign players with Prem experience. Are there many of those plying their wares there? Whichever, it looks as though Hughton’s just getting on with things in his own sweet way, keeping his powder dry and like January, I wouldn’t be surprised to see a couple of quality players coming in. Ashley never fails to surprise does he!! The only bitterness seems to be coming from you MacM,but as you come from a group of fans who would prefer both NE teams to lose as opposed to both winning I wouldn’t expect anything else.Worry about your own team and let us worry about ours. You lot seem to have done alright without ANY ‘premier-quality’ players. Mind, having a Geordie manager must have helped. Oh dear MacM….. what a short memory you have. How many weeks ago was it when your lot looked near the Prem departure lounge and Bruce’s position looked a bit shakey? The thing you’ve missed is that there’s no great ambition at NUFC for the next season and we’re not blowing any trumpets…. so let’s just see how things pan out eh? MacM- “Of course you’ve got no money”..A strange career choice for you, working along side Mike Ashley at Newcastle. Didn’t that job become unbearable after it was revealed you followed the filth?..After all, thats the only way you could know we had no money to spend. If not, you’re deciding your opinion is fact, the height of stupidity. I wouldn’t expect much more from your lot though to be honest. 8-10 players needed? Hilarious. Who is our 1 player of Premier League class then?.. Mackems are always the same man. They’d rather se us lose than see themselves win. Darth – Thats unfair. They have one PL player in Bent. What happens if he gets injured though? God I’m looking forward to the coming season……and Ross, your only comment making any sense was enquiring which toon player is Premier class….a fair point well made. Couldn’t make head nor tail of the rest though – hope you don’t have to write for a living! Macm-it really wasn’t too hard. I merely implied that you must work alongside mike Ashley at Newcastle to be sure we don’t have money to spend this season. Don’t worry though, I’ll put it in black and White for you!…. I like Niall Quinn. He always seemed to give 100% when playing for Ireland. He seems honest as the day is long and he can also do a brilliant tarmac job on your drive. As for decent players from the Makems, I’d take Kenwyne Jones over Bent any day of the week. The kid is class. I can’t wait for the derby games, it’s the only thing I missed about the PL,laughing at the makems. 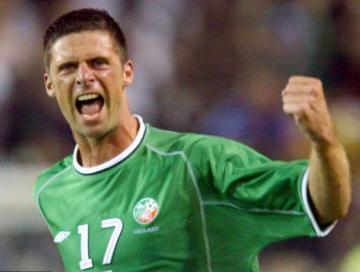 Scum legend Niall Quinn 141 league goals in 475 appearances. 61 league goals in 203 appearances for Sunderland. Toon legend Alan Shearer 283 league goals in 559 appearances. 148 in 303 for Newcastle. Shola Ameobi. 42 goals in 208 appearances for Newcastle. I’d say Niall’s much closer to Ameobi than Shearer. Yet he is a Scum legend??? hahahaha… Thats embarressing! I reckon Quinn’s actually playing an excellent game here. – He KNOWS Mike Ashley has no money to spend. – NUFC have been honest this time around and lowered the fans expectations. Surely a tactical victory here because I can’t see Mike getting out of this one.